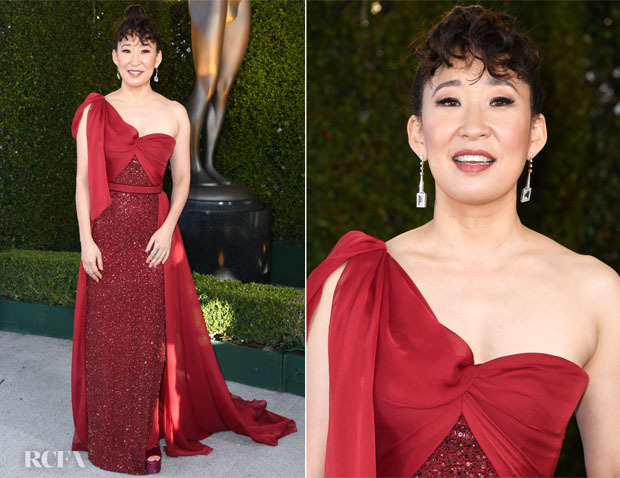 Sandra Oh was also at the 2019 SAG Awards on Sunday (January 27) in LA. Striking a dynamic pose, the ‘Grey’s Anatomy’ star and ‘Killing Eve’ nominee wore a ravishing red Jenny Packham Fall 2018 gown that I warmed too far more quickly than her prior Critics Choice entrance earlier this month. The crimson shade with its scintillating embellishment was lovely on her, especially when paired with Atelier Swarovski Fine Jewelry and a flirty-sophisticated updo. I will pretend I don’t see the massive platform Gina heels, as at least they match the colour of the dress.